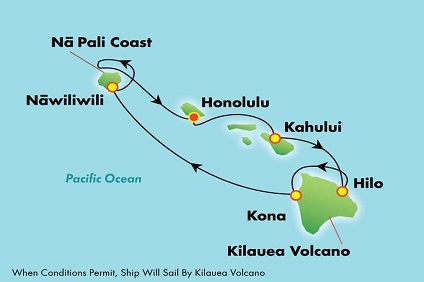 With our unique 7-day Hawaii cruise itineraries, you get overnights in both Maui and Kauai as well as visits to Oahu and the Big Island of Hawaii. You'll be on island time as you discover cascading waterfalls, active volcanos, black, green and white sand beaches, historic sites and unspoiled nature.yours. Named after the Wiliwili trees, which once lined its picturesque harbour, this lovely port of Kauai is your gateway to what many believe to be Hawaii's most beautiful island. On "The Garden Island," nature is truly the star, from the dramatic mountains of Kokee to the cool rainforests of Haena. And the tradition of the luau adds lively entertainment unique to Hawaii. *Conditions Apply: Please note that the prices shown here are not shown in real time. While we endeavour to keep our pricing as up-to-date as possible, the advertised prices shown here may differ from the live prices in our booking system. Offer subject to live availability at time of booking. Prices are per person share twin (unless stated as quad, single or triple) based on best available cruise fare, inclusive of all discounts unless otherwise stated. Outside and Balcony cabins may have obstructed views and Suite cabins comprises Junior Suites, Mini Suites and any other type of suite that represents the best value for each cruise. All prices based on cash or cheque payment - credit card fees may apply. Some cruise lines reserve the right to impose a fuel levy if the NMEX price reaches a certain level - please check with your consultant at time of booking. Cruise deposit, amendment and cancellation conditions apply. Travel agent service fees may apply. Special conditions apply - please ask for full details at time of enquiry. All passports, vaccinations and visas are the responsibility of the travelling guest to secure prior to departure from Australia. This cruise package is provided by Seven Oceans Cruising, please ask your travel agent to contact us for more information.